John Kenneth Muir's Reflections on Cult Movies and Classic TV: CULT TV FLASHBACK # 35: The Fantastic Journey: "Beyond the Mountain"
CULT TV FLASHBACK # 35: The Fantastic Journey: "Beyond the Mountain"
In the mid-1970s, Star Trek was a gigantic hit in reruns (in syndication), and accordingly the broadcast networks were once willing to take a risk on science fiction and genre programming despite the ratings failures of high-profile productions like Planet of the Apes (1974) and Kolchak: The Night Stalker (1974-1975). One such program was Bruce Lansbury's short-lived The Fantastic Journey (originally called The Incredible Island), which was a sort of "civilization of the week" series (like Trek, Space: 1999, The Starlost and other early seventies endeavors). One thing that differentiated The Fantastic Journey from those other sci-fi series was that it was determinedly "low tech." 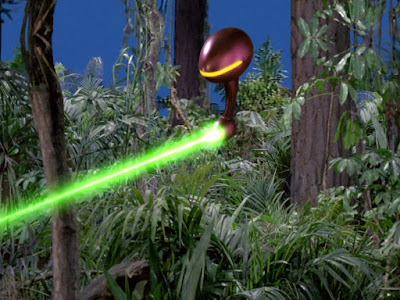 There were no spaceships or tricorders on hand (though one character, Varian, was armed with the equivalent of Dr. Who's sonic screwdriver, here a tuning-fork device of sorts), and almost the entire series was set "outdoors" in the wilds of a mysterious island. Although it ran only ten hour-long episodes beginning in February of 1977, looking back today one can see that The Fantastic Journey featured all the elements that could have made it a huge success. The premise was fascinating and timely. There was a cultural fascination in 1970s America with Bermuda Triangle lore, and that enigmatic "zone" is at the core of The Fantastic Journey. Here, travelers from all different worlds and times become lost in the Bermuda Triangle (thanks to a green fog on the ocean..) and then trapped on a vast jungle island comprising various "time" zones (and thus various civilizations). One day, a character might encounter historic pirates (as in the pilot episode "Vortex," which featured Deadwood's Ian McShane), the next he may be dealing with futuristic civilizations ("Atlantium.") So the format was flexible enough to accommodate all sorts of stories and plot lines. Also, the characters were interesting and diverse. Representing the audience were two people from 1977, young Scott Jordan (Ike Eisenmann) and an African-American physician, Dr. Fred Walters (Carl Franklin). On their journey, they encountered a "man of the future" (from 2230), the peace-loving Varian (Jared Martin), and a psychic woman from another civilization with unique mental abilities, Liana (Katie Saylor). With Liana's cat, Sil-El, in tow, this diverse group formed an ad hoc family of sorts, and together sought the zone called "Evoland." This was a legendary realm where, according to myth, wayward travelers could be sent home to their various worlds and time periods. The third episode of the series, "Beyond the Mountain" introduces the last piece of the character equation: Roddy McDowall's temperamental scientist, Dr. Jonathan Willaway, a man whose plane disappeared over the Sea of Japan in 1963. In this story, the other travelers are engulfed in an eerie red-colored storm and promptly separated. Liana ends up in a paradisaical, luxury villa, where Willaway - a very "strong willed man" - is tended to by subservient humanoid androids. The other characters are cast down into a misty swamp of gnarled trees and fog. The swamp (which looks like Dagobah...), is impressively-presented, having been constructed on a sound-stage and seeming very atmospheric, especially in contrast to Willaway's sunlit world, where the grass is literally always greener. Before long, Willaway decides he wants to marry Liana and attempts to keep her from searching for her friends, even as his android "son" begins to develop emotions for the lovely woman. Down in the swamp, Scott, Fred and Varian encounter a race of green-skinned humanoids, aliens called "Arujians" (think Indians). Their leader is ill from a "bacterial disease" (malaria), and Varian and Fred heal him. Once recovered, the leader explains that Willaway came to their land, subverted the androids and banished the green-skinned humanoids to the swamp. "He does not think of us as beings of any worth," the leader comments about Willaway, and one can see how the episode's central metaphor is crafted. "Beyond the Mountain" is a comment on, for lack of a better word, "the white man's burden," and here a white westerner has re-located a race of "lesser beings" off their land for his own benefit. Just substitute green skin for red skin, and you get the idea of the symbolism. It isn't just the relocation of Native Americans to reservations that "Beyond the Mountain" comments on, at least obliquely, but also the very idea of slavery (again - back to the white man's burden). Here, Willaway keeps a society of androids serving him and is unable to countenance the idea that they could be sentient. They are only "an amalgam of simulated flesh and bone," he says at one point. He tells his son, "your marrow is transistorized; your heart is a battery; your veins and arteries are wire filament." This might be another way of saying that because their skin is different than his; they are "less" than human, a belief of slave owners in America a hundred and fifty years ago. Also, Willaway generally treats his androids (again, think historically: slaves) with what he believes is love and kindness, even though he is still master and they still servants. However, reflecting the dark side of the equation, when challenged by a female android, he warns her that if she misbehaves, he will "take her apart." When the enslaved androids finally rebel against him, Willaway is baffled. "I gave you a beautiful place to live. I even made you my son..." he says, feeling betrayed, unaware that his "children" are ready to chart their own destinies. So, in the course of one episode, Willaway displaces one ethnic group (the green-skinned swamp dwellers), and enslaves another (the androids). Or as he puts it at the denouement, society and he "do have problems." In the end, with the help of the series regulars, both races are freed, and Willaway is sent packing. Surprisingly, Varian shows mercy to Willaway and allows him to travel with the group. Again, this was the final piece of the character puzzle: Varian, Fred, Liana and Scott are all likable, heroic characters, whereas Willaway (as this episode reveals) is more flawed; and more willing to strike off with his own agenda. He isn't a constant foil (like, say Lost in Space's Dr. Smith), merely a fly in the ointment and wild card. The ending solution, Willaway joining the team, so to speak, works well story-wise and is even believable because Varian is a man from a peaceful future; one where men don't hold grudges or act in petty fashion. He is the series' version of the peaceful and enlightened Spock, and a great character. In the spirit of Star Trek's "Requiem for Methuselah," Space:1999's "One Moment of Humanity," Star Trek: The Next Generation's "The Offspring," and the new Battlestar Galactica's "Downloaded" this Fantastic Journey episode also involves the idea of an android (or androids, plural) attaining humanity or understanding humanity. Willaway's son in this episode dies (in love with Liana), a "tear" falling from his cheek. Again, this is sort of a de rigueur concept in science-fiction television; done on virtually every series from 1966-1978, probably. Still, it is handled here well enough; though the depiction of the androids (lanky men and women in gold lame jumpsuits with circuit panels on their backs...) reveals the age of the series (thirty years!) and the relative innocence of the genre back then. The Fantastic Journey has always been one of my favorite mid-1970s American sci-fi series. Logan's Run (the series) pretty much adopted a similar formula later in 1977 (during the fall season), and even Sliders and the oft-forgotten Otherworld (1985) owe something to this show. What I always appreciated most about The Fantastic Journey was the well-developed characters, and the charming interplay between them. The series only lasted ten episodes but it had enormous potential. Not surprisingly, it still boasts a rabid fan base. Probably not a week goes by without someone e-mailing me about The Fantastic Journey at my web site (where I have a "retro TV file" on the show), which I believe is a testament to the solid groundwork that series writers (including Dorothy Fontana) laid down all those years ago. I suppose some audiences would look at the production values of the series today and conclude it is campy (no!!!! ), but like every TV series and like every work of art, it is entirely a product of its age and original context. The Fantastic Journey is gloriously 1977 (pre-Star Wars), and fantastic indeed. I'd love to see an official DVD release soon. A great show! A DVD release is a definite must! Does anyone have contact information for the TV on DVD team at Tri-Star/Columbia? BTW--there was a syndicated FANTASTIC JOURNEY movie called LOST IN TIME which was a compilation of the first two episodes. Does anyone remember Ike Eisenmann's guest appearance on VOYAGERS! (Episode #14-"Sneak Attack") as Buffalo Bill Cody? The only way I'd be interested in buying this series would be if it also contained cast interviews from different periods of time discussing the show. Since the show never ended, it would be nice to know some things. If there are old cast interviews, perhaps this might be possible.. However, since the DS interviews were at some of the DS festivals, and this show kind of bombed for no reason, such interviews may not exist for the Fantastic Journey. I absolutely love the Fantastic Journey. I think it is a very intriguing show and I could see the potential of it having gone further. I watch the show for Roddy McDowall's character Willoway. I think he is the coolest character because of how complex he is. But I have to say, I just saw the 'Beyond The Mountain' episode just now and although when I saw it I didn't get the same out of it as you did, I can understand where you are coming from. When I watched it, I thought the idea of the show was that Willoway was disgusted by the "human condition" of war. That he didn't like how he was cast aside by the scientists of his time and in general he was not happy with the way people were during his time. So, he created his "ideal" world with the perfect villa, the pond, and all of his agreeable robots. And there he felt accepted and didn't have to worry about wars or anything because through his eyes everything was 'perfect.' And then at the end when his son starts to fall for Liana and turn against him, he feels like he is not being accepted again and that even his perfect robots turned against him. And he realizes that he can't find the acceptance he wants, until Varian asks him to join them on their journey. I really enjoyed your blog. Do you happen to know where I can read the unrecorded 11th episode script? I heard rumors it has floated around on the internet. In the first episode, isn't the captain of the boat Leif Erickson from The High Chaparelle western series? I loved this series! This show had such potential. I loved varian and Scott's father son relationship! I thought future writer director CARL FRANKLIN as Fred was spot on in his chemistry with Jared Martin !!!! Is possible to have a copy of The Fantastic Journey in Spanish...? Unless Sony decides to issue this show on pressed DVD instead of burned DVD-on demand, no, there won't be one. And I don't think that Sony will bother, as the show wasn't popular enough, was not rerun because it only had a few episodes, and doesn't have the audience needed to justify making any standard DVD's burned DVD's-on demand, or even Blu-Ray's.